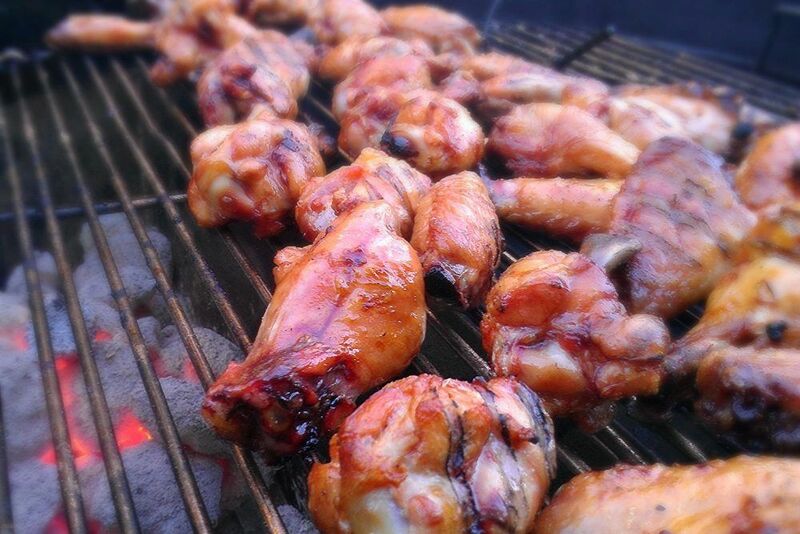 What summer cookout is complete without BBQ chicken? Maybe you’re not into cooking a whole chicken, and prefer to stick to easier to manage pieces like drumsticks (legs) or thighs. 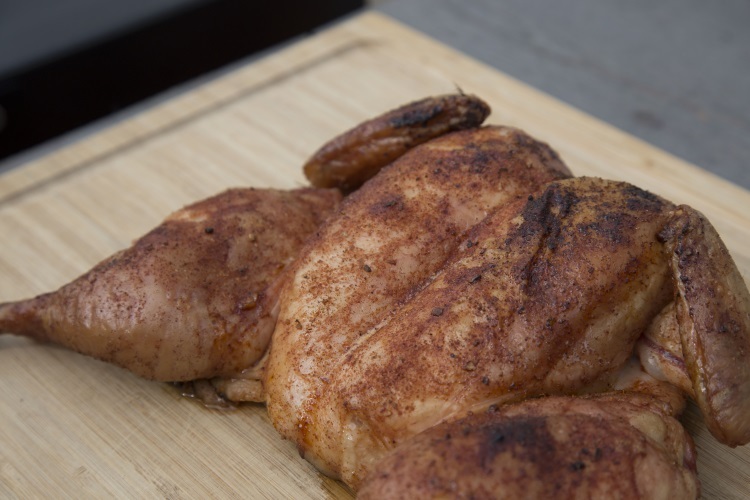 Legs and other chicken pieces are inexpensive, easy for kids to handle, and very easy to grill properly. In fact it’s no harder to cook them perfectly than it is to overcook them and burn the sauce. 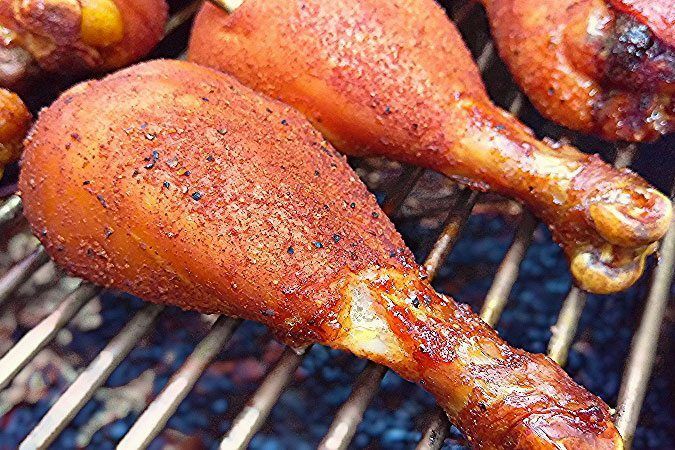 As always, we’ll explain some helpful tips to get your drumsticks grilled properly so you can serve them to you family and friends with pride. Many supermarkets will sell packages of chicken legs or thighs quite cheap. Cheaper yet is the chicken when it comes in “leg quarters” or “quarters”, with the drumstick & thigh connected. The indirect side of your 22” kettle grill equipped with your Slow ‘N Sear will easily contain 16-18 legs depending on their size, or easily a dozen thighs; the 26” kettle will of course hold many more. Trim: Often the leg & thigh pieces could use some trimming to remove excess skin & fat, which is easily done with kitchen shears. This isn’t mandatory, so you can skip trimming them if you wish. Pat them dry. Just place them on a couple layers of paper towels to dry the bottoms and pat dry the top. Dry Brine: Even if we plan to use a highly flavored BBQ sauce, the pieces should still be salted. A light dry brine is a quick & easy way to amp up the flavor before cooking. Simply salt lightly either with a salt shaker or sea salt grinder, or even as we might dry brine other meats- by lightly sprinkling with Kosher salt. Flip them and lightly salt the other side. Add what feels natural, don’t overdo it. They may be cooked right away without waiting any amount of time for the dry brine to happen, or if you have the time you may keep them in the fridge for an hour or more if you wish. Some will dry brine chicken pieces overnight, and this is fine too, in fact it’s arguably the best way to do it. Stir well until all the salt & sugar is fully dissolved before adding the chicken! The amounts may be doubled or halved based on need, just keep all the ratios the same and the time at 1 hour. If you brine these longer than 1 hour you may find them to be too salty. We recommend you follow this the first time, and make timing adjustments to suit your taste next time if necessary. 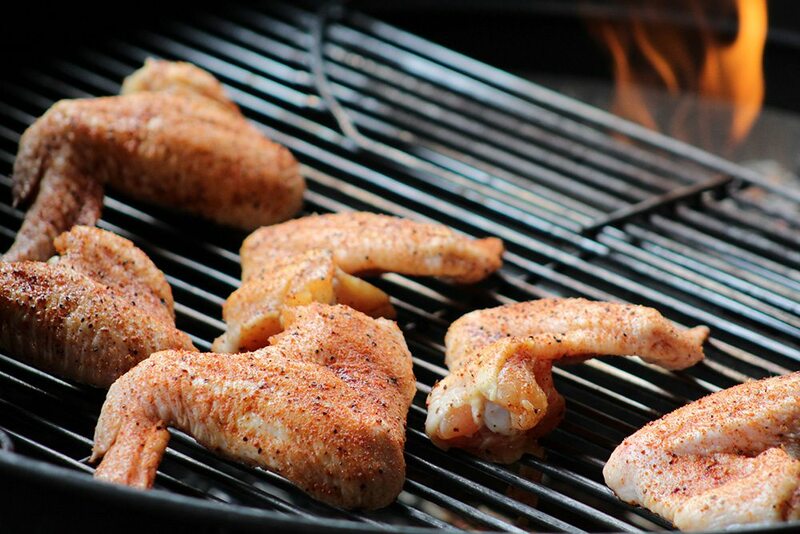 As with most poultry, we want to cook wings hot, at 325° or higher. Please follow our Hot & Fast 325° lighting technique with your Slow ‘N Sear. At this temperature, wings will typically take about an hour to cook, maybe up to 90 minutes if they are big pieces or were still par-frozen when the cook started. This is fairly easy to achieve with about 1/2 to 2/3 of a chimney (~40-50 briquets) of hot, well-lit coals. If the weather is cool, rainy, or cold in your area, the “More Longevity” section of our 325° lighting technique can be followed, which involves adding about half a chimney of unlit coals to the Slow ‘N Sear first, then adding the half chimney of well-lit coals on top of the unlit coals. Water is not necessary with a hot & fast cook such as with chicken wings, so the water reservoir may be left empty. As with most poultry, we want to cook skin-on legs & thighs hot, at 325° or higher. Please follow our Hot & Fast 325° lighting technique with your Slow ‘N Sear. At this temperature, they’ll take about an hour to cook, give or take, and maybe longer if they are big pieces or were still par-frozen when the cook started. This is fairly easy to achieve with about 1/2 to 2/3 of a chimney (~40-50 briquets) of hot, well-lit coals. If the weather is cool, rainy, or cold in your area, the “More Longevity” section of our 325°F lighting technique can be followed, which involves adding about half a chimney of unlit coals to the Slow ‘N Sear first, then adding the half chimney of well-lit coals on top of the unlit coals. Water is not necessary with a hot & fast cook such as with chicken wings, so the water reservoir may be left empty. Place a thermometer probe at the grate, and be sure to maintain 2”-3” clearance on all sides from the cold meat. You can place a leave-in thermometer probe in the pieces if you wish, this is possible with legs but not necessarily mandatory, and it’s easier with thighs. Make sure the probe is not touching bone, as bones can skew the readings. 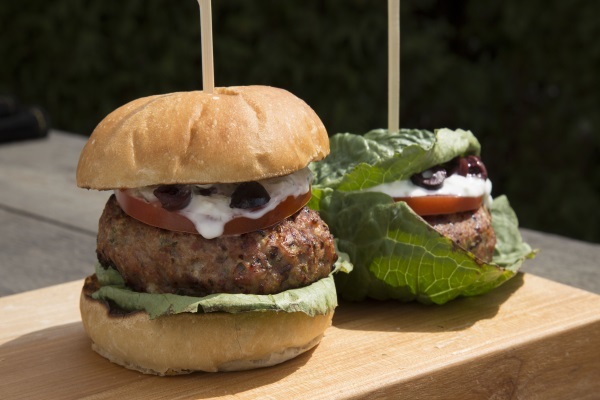 An instant-read thermometer is also a great idea to double check finished meat temperatures. 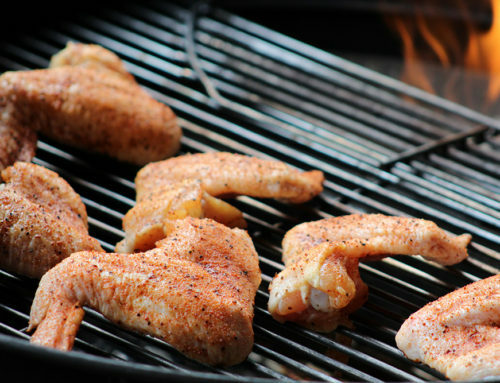 The USDA says poultry meat should be taken to a minimum of 165°F. 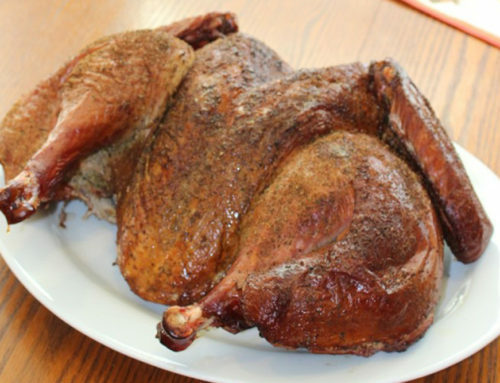 You’ll likely find dark meat to be less appetizing at this temperature. We recommend going higher with legs & thighs. 180 or 190°F is great with these dark meat pieces. 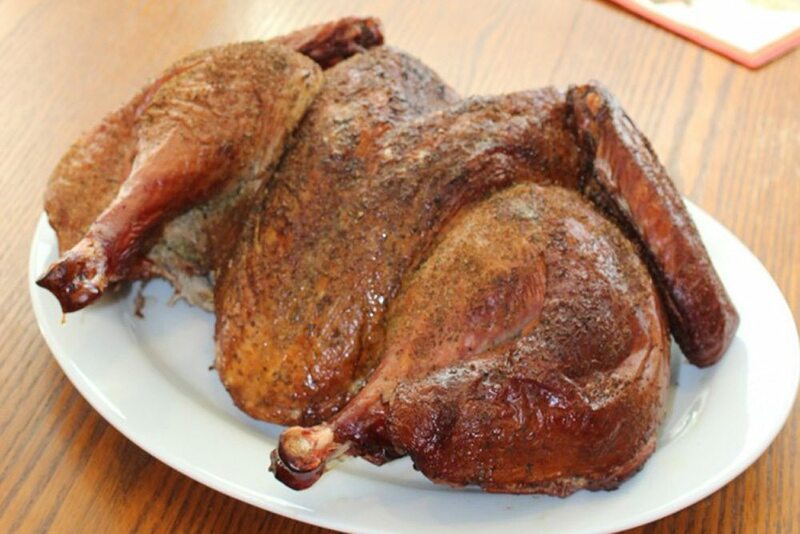 At 165°F dark meat can have a slimier texture and is often much less appetizing. It’s a good practice to flip the legs after about 30 minutes at 325°-350°F and begin checking their internal temps. Thighs may not need flipping since most of the meat will be on the top side where the cooking temps are hotter. Since individual tastes vary, this will be a matter of personal preference. If you’re using a store-bought BBQ sauce, which are usually heavy on the liquid smoke flavor, smoke isn’t necessary during the cook but it surely won’t hurt. If you’re eating them without sauce, we recommend using some wood to add a little smoke, but it’s not mandatory of course. 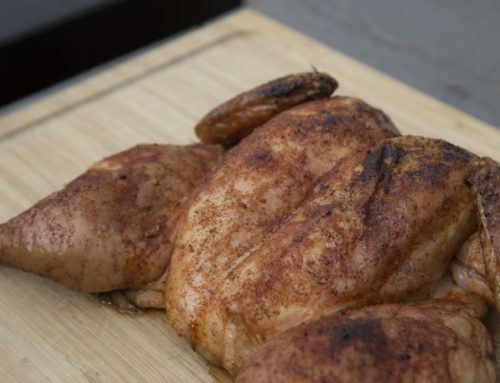 Following the above wet brine recipe may be all you need for delicious chicken pieces. Again, individual tastes will vary. 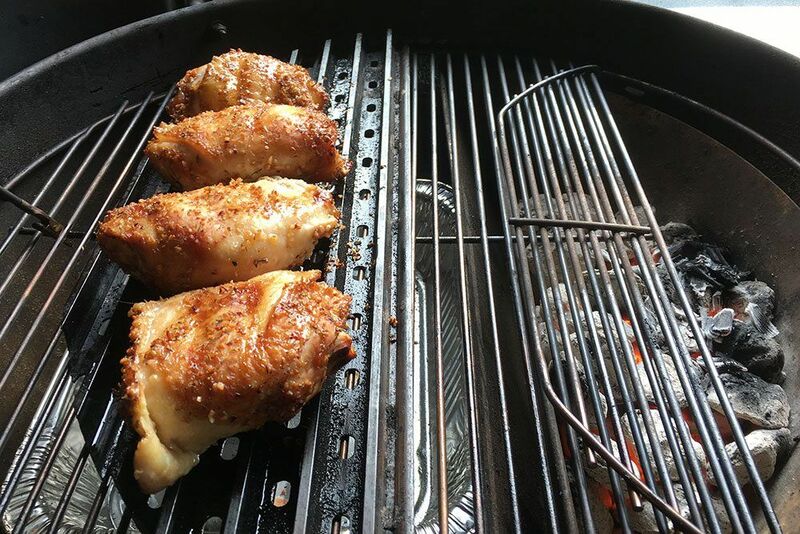 Some do not like the taste of a char sear on chicken skin, and searing legs & thighs is very easy to char them due to high level of fat dripping. 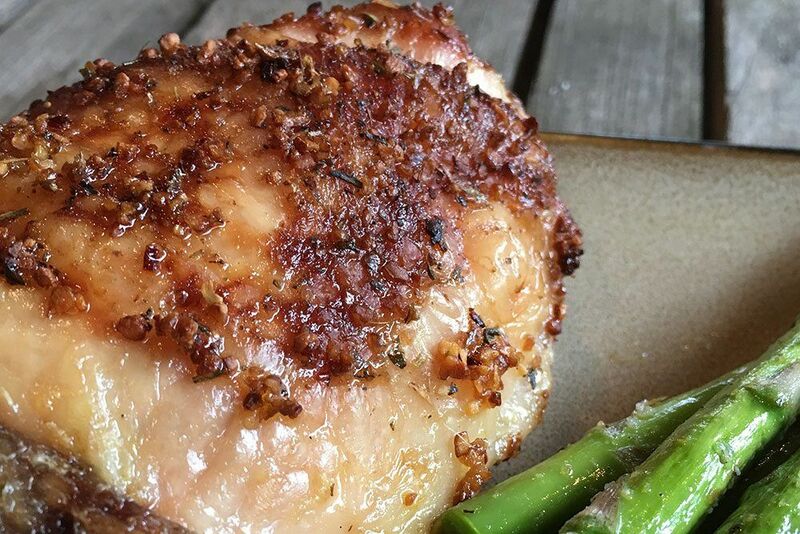 If cooked per the above guidelines and your temperature remains at 325°F-350°F, your chicken should develop a nice golden brown hue and crispy skin simply by convection, without a sear needed. If you’re unsure, try some of each until you learn your & your family’s tastes. Just about any sauce can be used on legs & thighs. Your local supermarket will have dozens of sauces to use, and you probably already have a favorite. 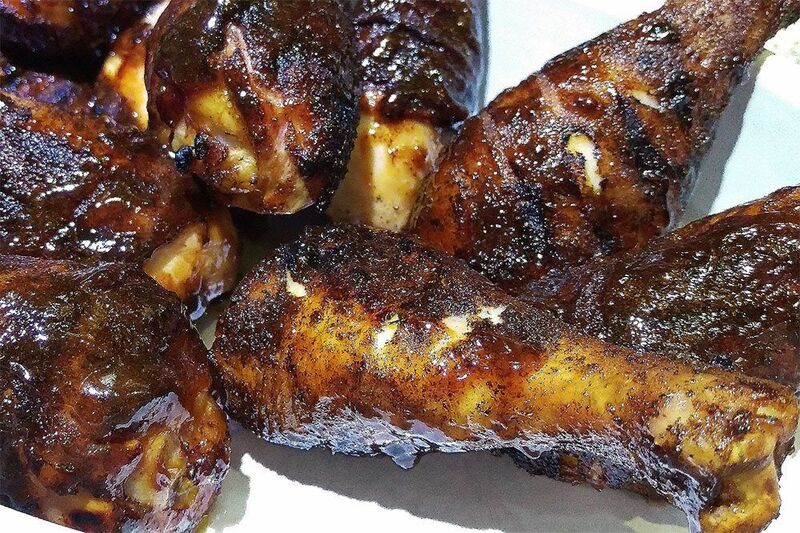 You can of course use your favorite homemade BBQ sauce recipe too if you have one. If you’d like a great homemade BBQ sauce recipe, try Meathead’s KC Classic BBQ Sauce! The same goes for marinades there are many to choose from! If using a marinade, especially if it contains salt or a salt-heavy ingredient like soy sauce, skip the wet & dry brines and stick with only the marinade and follow its directions the first time before you choose to experiment. Some saucing tips: The sugars in the sauce will begin to caramelize at temps above 320°F, so adding the sauce at the very start of the cook could over-caramelize or burn the sauce, even when cooking indirectly. Warm the sauce up in the microwave or on the stove before adding to the meat. 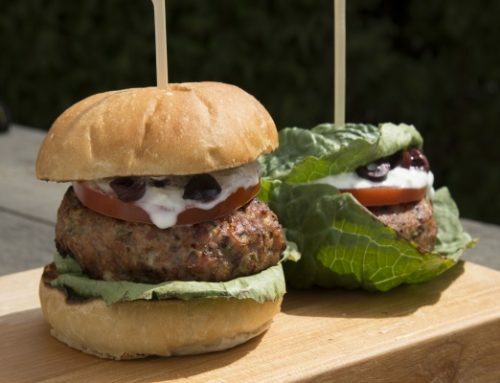 There’s no point in adding cold fridge-temp sauce to 160°F meat! Zesty Italian salad dressing – (many brands make zesty Italian, common ones in the USA are Kraft or Ken’s, among others). Marinate them from 1hr to 8 hours. You could try marinating overnight too. Turn often if the pieces are not fully submerged. No further seasoning or salt should be necessary. Adjust next cook if necessary. If you’ll want to paint the meat with more marinade during or near the end of the cook, then set some marinade aside before marinating the raw meat in it. NEVER use marinade that’s contacted raw meat on cooked meat! Buffalo sauce on legs & thighs? That’s right! Who says Buffalo sauce is only for wings? It goes great on larger pieces too! Frank’s Original RedHot™ and Frank’s RedHot™ Buffalo WIngs are some easy to find favorites for the classic Buffalo wing flavor. Frank’s is reportedly the actual sauce used in the original creation of “Buffalo wings” in Buffalo, NY in 1964. Today there are quite a few brands with similar profiles. 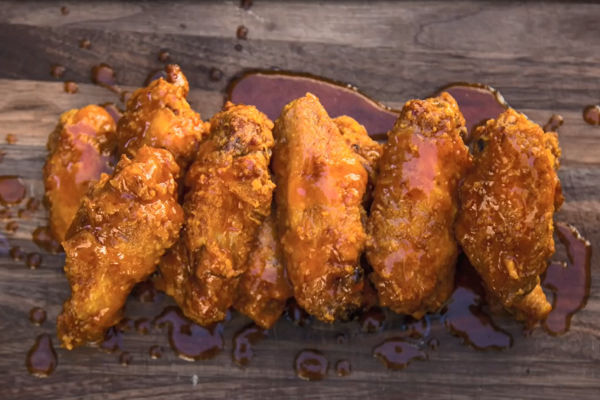 Even some well-known local “wing joints” typically sell their proprietary sauces, often in many flavors and heat levels, retail, in-store, or online. If you have a favorite place, stop in & ask! 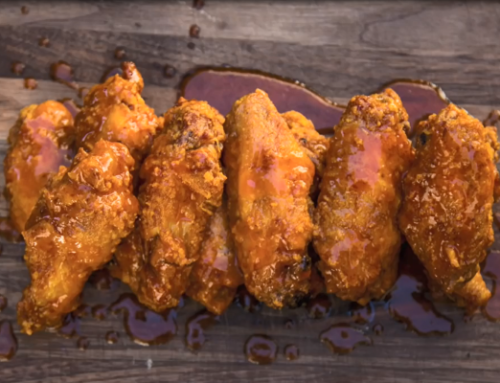 Moore’s Original Buffalo Wing Sauce is another one of our favorite commercial Buffalo sauces. If it’s available where you shop be sure to give it a try. add 1/2 cup of Frank’s Original. Stir well to mix. Or, Frank’s has taken the labor out of it for you by bottling their Frank’s RedHot™ Buffalo Wings sauce. (But homemade is better, trust us). Don’t add your sauce at the very start of the cook! We highly recommend you cook the meat first, then add the sauce toward the end of the cook. There are a couple ways to sauce your chicken pieces. Add it when the meat is fully done and then sizzle the sauce over the direct heat of the Slow ‘N Sear like you might do with ribs. If you sizzle your sauce, watch it like a hawk. It can burn quickly! Turn the pieces frequently until it gets the caramelization that you want. You can also add it when the meat is fully done and not sizzle the sauce, or simply add it at the table. Warm the sauce up first, especially if only serving it at the table. Who says you have to use sauce? Properly brined and seasoned chicken is delicious on its own. 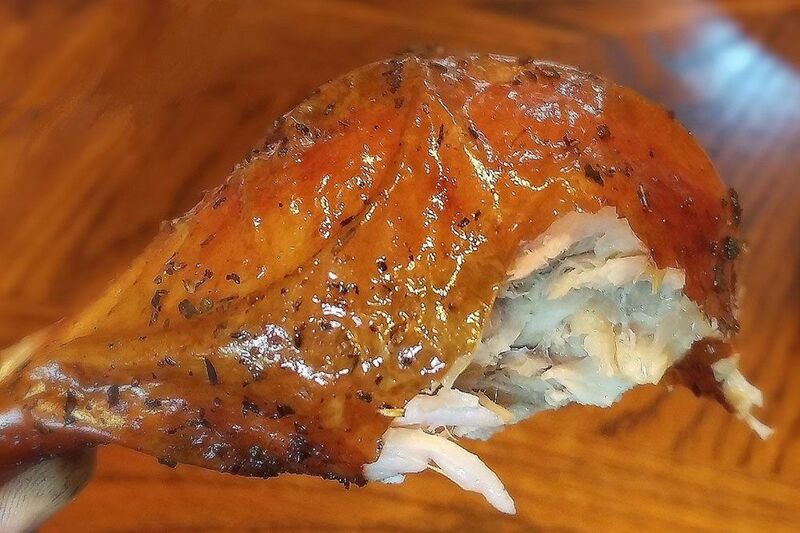 In fact, many pitmasters take pride when their friends, family and customers enjoy their food without sauce! Add any or all of the following: fresh cracked pepper, garlic powder, Italian herbs (sometimes called Herbs de Provence) such as basil, oregano, thyme, rosemary, sage, etc. Maybe it’s too early and I need more coffee but your chicken marinade lists Zesty Italian dressing as the ingredient, but the instructions say mix the 2 ingredients together. What’s the missing SECRET ingredient? Hey Drew, sorry about that. Small formatting error turned Moore’s Original Marinade into the title rather than an ingredient. It should read correctly now – thanks for the catch!